The GS-911 is a diagnostic tool to execute diagnostic functions like "Error – read and delete" on modern BMW’s motorbikes. It consists of a GS-911 Interface for PC´s with USB connection and the GS-911 diagnostic software. 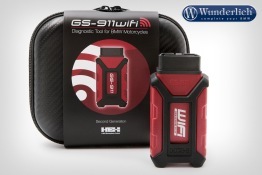 Depending on the model there are three versions with WiFi data transfer available. They can additionally work on Win Mobile (5/6) or on Java based software or platform, independently on a browser over mobile terminal devices like mobile phones, smartphones and Blackberrys. The WiFi version is consequently also suitable for Apple iOS (iPhone, iPad). Hobby / Enthusiast version - storage of up to 10 chassis numbers possible. Menu navigation in english and german language. USB driver certified for Windows 8. RDC (ReifenDruckCheck=Wheel Pressure Check) function – Train new sensors and their data..
One button to delete all errors at the same time! Support of iABS-CAN (ABS3CAN) controller. (servo ABS Gen. 1 of CAN Bus models about 2004-2007). Display of engine temperature, when stepping motor is blocked during the synchronisation. Real time scope, graphic representation of measured values. Reset "Removal until next Valve Clearance Check" F (K2x) and K (K4x) models. This GS-911 wifi model is compatible with all newer EU-4 compliant BMW motorcycles with OBD-II connector ports. In addition, when used in conjunction with the female OBD-II to 10-pin adaptor cable this product is also backward compatible and supports ALL the previous models of BMW motorcycles that have round 10-pin diagnostic connectors.